Caves tend to be nutrient poor environments if there are no external influences. As such, the life that exists within caves is heavily dependant upon nutrients that are brought in from outside. 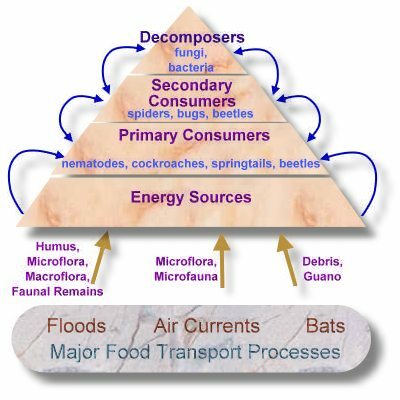 Mechanisms that can bring nutrients into the cave include water flowing, either as floods or streams, air flow or animals bringing nutrients in, such as bats. The largest variety of nutrients and lifeforms occurs close to the entrance in what is known as the twilight zone of the cave. This is the area that is not in full sunlight, but some light reaches it regardless. Plants can't function in the cave food web due to the lack of sunlight, which prevents photosynthesis from occurring. Bats are able to bring nutrients deep into the cave which in turn can feed the various organisms living far from the entrance. Care must be taken to avoid disturbing bats in caves as this may cause them to either die or leave the cave. When this happens the cave ecosystem is denied a major source of nutrients and hence those organisms dependant on the bats will also die out. When visitors come to Jenolan they are asked not to eat or drink whilst on cave tours. This is because dropped food or spilt sweet drinks will upset the food web within the cave. Areas that are normally deprived of nutrients suddenly find themselves supplied with it. This can cause some organisms to increase in number and lead to the death of other organisms. When the food source is depleted, the organisms that increased their populations due to it now die out. By this stage the original organisms may have been sufficiently depleted in number that they too die out. Food dropped in the caves can also serve to encourage animals that don't normally enter the caves to come in searching for whatever they can smell. Rats are significant intruders. Whilst in the caves the rats may then start feeding upon other organisms such as cockroaches or even bats, upsetting these populations. The diagram shown is based upon that found in David Gillieson's book Caves - Processes, Development , Management published by Blackwell Publishers, Massachusetts, 1996. It is possible to witness some of these components when on cave tours at Jenolan. Air Currents - These are most pronounced in the entrance regions of the Lucas and Imperial Caves. Bats - Frequently sighted in the Lucas Cave. Their droppings are quite prominent in the Mafeking Chamber in the Lucas. Water Flow - There is little opportunity to see the caves in flood as the flooded areas are closed to the public when this occurs. It is possible though to take a walk up McKeowns Valley to the point where the river submerges underground. Allow approximately 2 hours to reach the submergence point. Springtails - These appear as small white dots which move around on stalagmites. They may be seen in Katies Bower in the Chifley, Lots Wife in the Imperial and in the lower sections of the Indian Chamber, Orient Cave. You will need the assistance of your guide to find these. Spiders - Although hard to spot it is easy to see the spider webs which cover parts of the roof of the Grand Arch. These are the pale, pink patches on the roof. People who go on the Plughole tour may see spiders on that tour. Other Insects - An eagle eye throughout the caves may spot other insect types, especially near the entrances. The Chifley Cave has a large insect population as the cave is frequently near to the surface.